Nothing beats the melting succulence of a fresh, ripe, well-grown pear. I love these versatile fruits poached in red wine. They taste great with walnuts and sharp autumn greens, or with bacon and ham. They elevate the simplest food to gourmet status. Pears are the most reliable fruit in our garden. They crop heavily, to the point you need to plan how to manage the supply. Up to 30-40kg of fruit per tree is not unusual. They are also long-lived. New Zealand’s oldest fruit tree is a pear planted in Kerikeri in 1819 by Samuel Marsden. Another reason I love pears is that out of all the fruit trees in our garden, they give me the least grief. They don’t succumb to pests and diseases like their stone-fruit neighbours. They are a great organic option. We can enjoy them without beating ourselves up for forgetting to spray. The added bonus? Pears are beautiful trees. Plant them where you can walk among them. In spring, the large, snow-white flowers are a delight. The shiny, dark green, oval-shaped leaves are attractive, healthy and shade-giving in summer. Come late summer, I love the effect of my red-skinned pears drooping from their espalier wire. In autumn, the trees turn beautiful, burnished shades of red and orange, a display that rivals any ornamental tree. 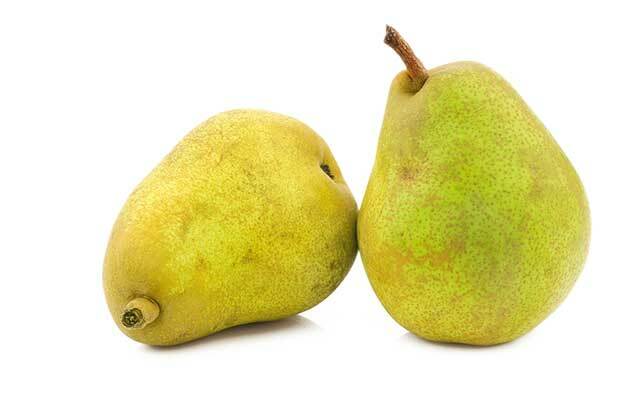 As a rule, pears thrive where apples thrive, but tend to be more tolerant. • Pear trees will grow where many other fruit trees won’t, tolerating heavier and sandy soils, and wetter conditions than apples, as long as their feet are not wet in winter, which they detest. • They grow best in a fertile, well-drained, clay loam – the roots are deep, so shallow soils are best avoided. • They like cool to cold winters (for chilling), mild summers and not too much spring rainfall. • They require a spot with full sun for good fruit set, but it needs to be sheltered as they don’t do well in strong winds. • The flowers appear about September, later than stone fruit but earlier than apples, which means they can be more prone to frost damage than apples, especially earlier varieties like Packham’s Triumph. • A compatible pollinator is needed for successful pollination and fruit set. 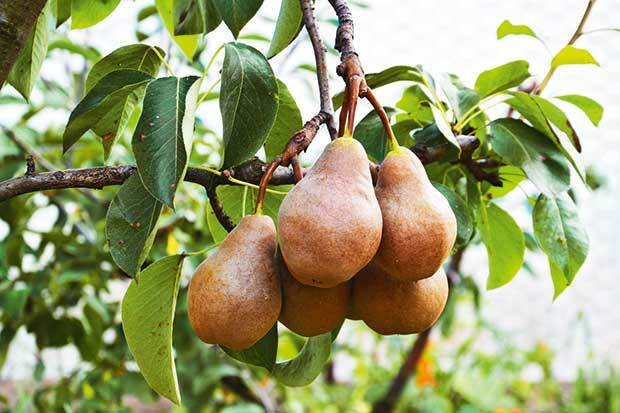 • Pears can get tall – a fully-grown tree on its roots may reach 12m at maturity. However, most home garden pears are grafted onto quince rootstocks, which keep height to 3m or so. Espaliers work really well too. • Mature trees are highly productive – be ready for lots of fruit. • Most varieties will need to be picked while hard, then ripened off the tree to avoid mushy flesh. 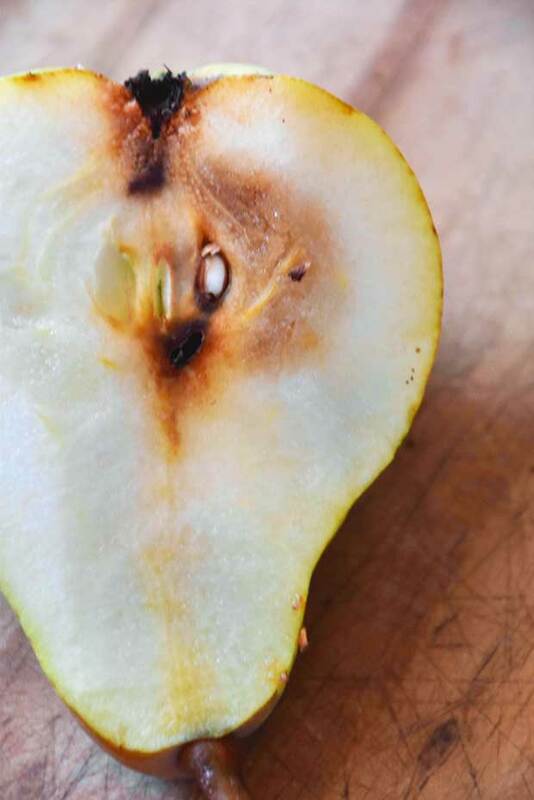 The soft, grainy inside of a ‘sleepy’ pear. The biggest lesson we have learned is it’s all about timing when it comes to harvesting. 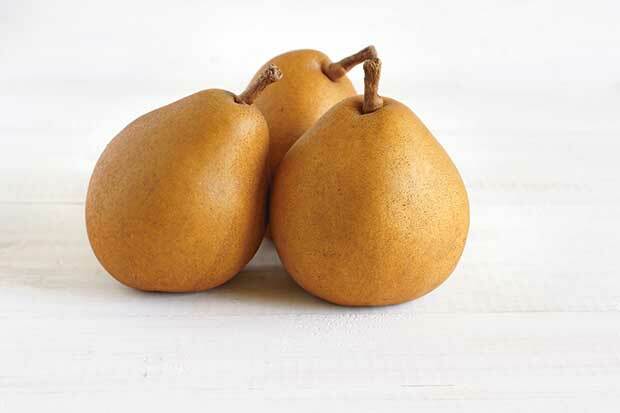 For the first two years we nearly gave up on our pears because of mushy, mealy fruit. We didn’t realise pears had special picking requirements. 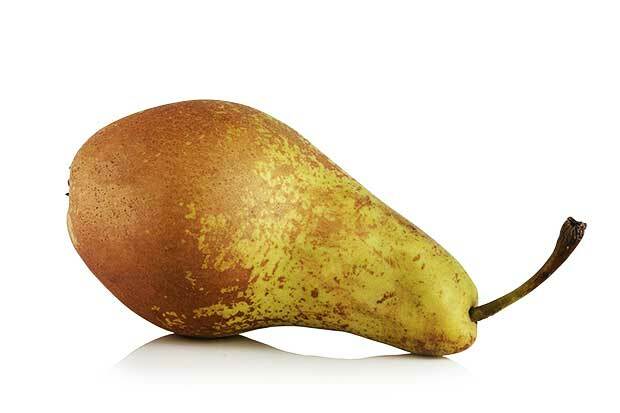 Pears need to be picked while still hard, chilled, and then ripened at room temperature. They ripen from the core outwards. If left on the tree to ripen, by the time the outside flesh is ready, the centres will have gone ‘sleepy’, unpleasantly soft and grainy, and perhaps even brown in the middle. Not nice. Many of the best home garden varieties are heritage varieties from the 19th century. Pears are grafted onto two rootstocks. Pear rootstock produces vigorous large trees that need space. Quince rootstock produces smaller trees which can be bought pre-pruned into pyramids, espaliers and fans, and even double worked with compatible pollinators. We chose dwarf heritage varieties on quince C rootstock, which only grow 2.4-3.5m high. We wanted variety in a small space and didn’t fancy climbing ladders to prune and pick. While they need strong stakes, dwarf trees have the advantage of fruiting earlier and lower, and are very productive in a small space. Pears are only partially self-fertile and most crop much better when paired with other varieties known as pollinators that flower at the same time. We had to choose carefully, given our limited space, to make sure we gave our trees the best possible pollination odds. 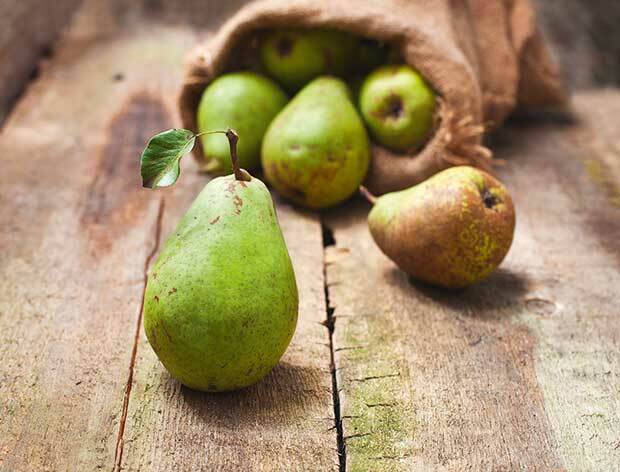 In general, pears ripen from late summer to early autumn. Start looking early though. This last, hot summer, my William Bon Chretien pears were ripe weeks early. At the point they are ready to pick, all you may see is a slight colour change as the skin lightens. Some varieties may develop a faint, warm blush. Deep green varieties will turn a slightly lighter shade. If you cut and taste fruit, it will be hard and woody but you can detect a slight sweetness. Windfalls may be a hint too. 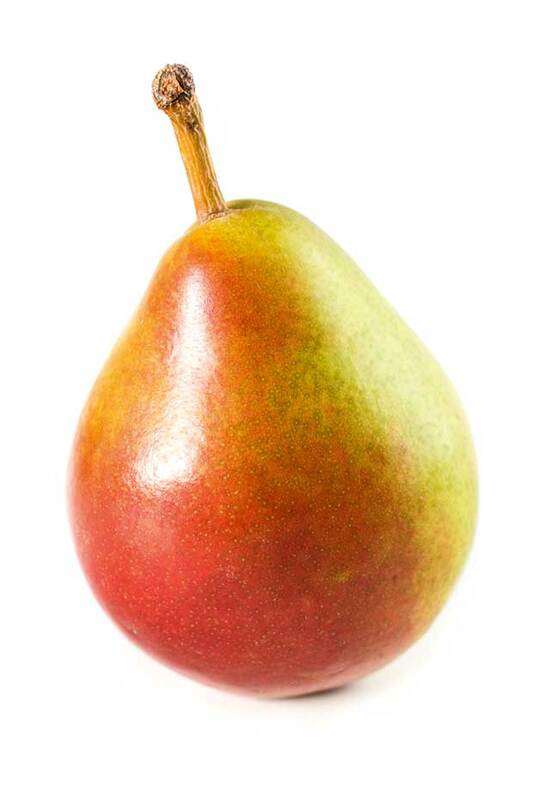 Lift a pear with a cupped hand until it is horizontal – if it comes away with the stalk still attached, it is ready. If it holds firm, it needs slightly longer. Once picked, fruit should be refrigerated. William Bon Chretien can be chilled a day or two, while winter pears such as Comice and Beurre Bosc prefer 2-6 weeks for optimal chilling. Also, the colder pears are chilled (down to -1°C commercially), the longer they will keep. Once chilled, they can be ripened in a warm room in a few days. The longer they are in cool storage, the quicker they will ripen. Test ripeness by gently pressing on the skin near the stem, but not too hard as the skin is very sensitive, even when the flesh is hard. 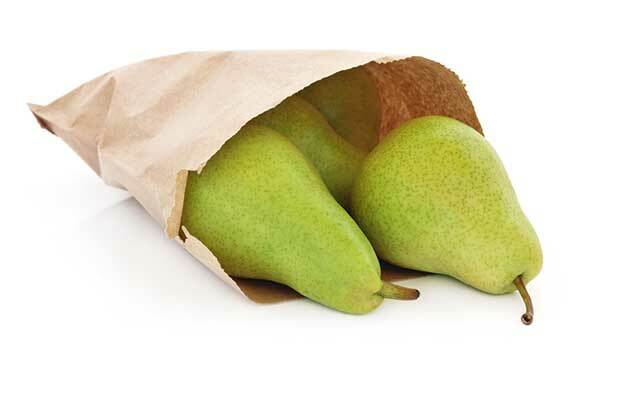 Ripening can be kick-started by putting a pear in a paper bag with a ripe banana or apple, both of which emit copious ethylene gas which speeds ripening.